This is one of the most spectacular major mint errors that I have ever had the pleasure of handling. It is a unique first strike full mirror brockage Barber Half. It is the only known Barber Half brockage for the entire series. It is almost uncirculated with original luster and beautiful toning. This show piece mint error has traded between many dealers and collectors in the last 30 years. Every time it exchanges hands it causes a stir and draws attention among mint error enthusiasts. It was originally purchased by Steve Estes in 1972, who is a coin dealer in Oregon. When Steve bought the piece he was told that it was kept in a small leather pouch for almost 50 years. The person who sold it to Steve was a teller at Caliente Race Track in Tijuana, Mexico in 1926. 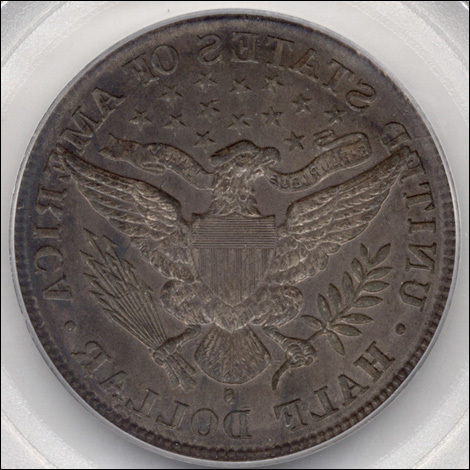 In 1976 Harlan White, another coin dealer, purchased this unique mint error as part of a large collection. It subsequently traded hands and was purchased by Fred Weinberg. 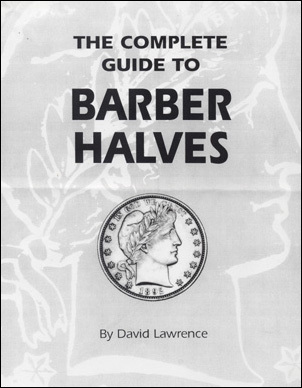 At one point in time David Lawrence, author of The Complete Guide to Barber Halves, also had the pleasure of buying and selling this piece. Robert Astrich, a coin dealer from Hempstead, Texas, also handled it and wished he had kept it for himself. It eventually became part of the Jerry Bobbe collection, who is a professional numismatist from Oregon. In 1997 Jerry Bobbe sold this piece to another dealer who offered it to me at the 2002 New York ANA. I was given the first opportunity to buy it from him. Having heard about this famous and unique mint error trading hands many times over the last quarter century, I immediately purchased the coin on the spot. This Barber Half brockage is graded AU 58 by PCGS. 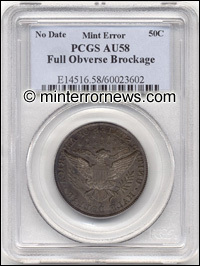 Since it is an obverse brockage there is no date, but it was struck at the San Francisco mint. It is struck on a planchet that has extremely smooth surfaces, no distracting marks of any kind, original mint luster, reflective fields and original golden brown toning. 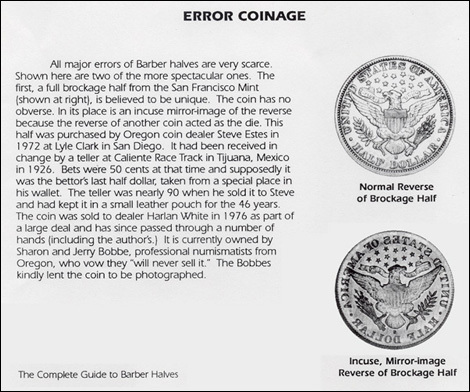 Since this was a first strike full mirror brockage mint error, the brockage is extremely deep, not distorted and was struck completely centered on the planchet without expanding beyond the collar.